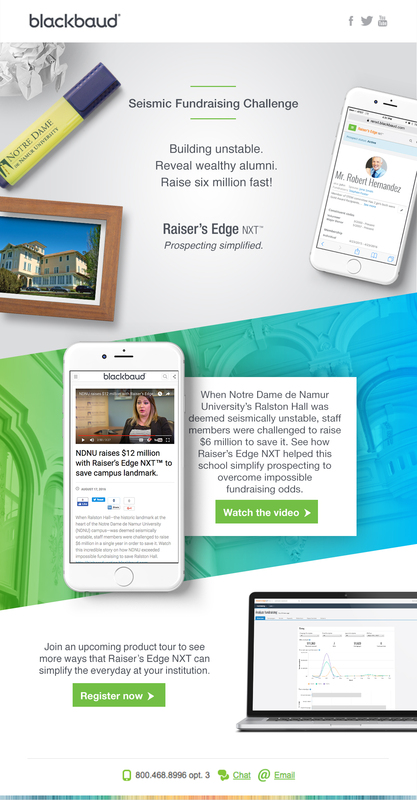 Blackbaud’s Raiser’s Edge NXT and Financial Edge NXT had been on the market for over a year, and the target audience developed the perception that the two solutions were too expensive and too complex for their nonprofits’ needs. While working at Agency 545 we were challenged to update the creative campaign for the NXT solution line to focus on how the solutions simplify work for nonprofit professionals. The solution I designed at Agency 545 was the “Simplified” campaign to emphasize this new value proposition for the NXT solutions. By pairing short haiku stories with minimal design, the concept communicates simplicity both verbally and visually. Each execution focuses on a single feature of the solutions, so as to not overwhelm the audience, and the product UX is seamlessly woven into the “personal desk” creative. The deliverables included emails, landing pages, digital ads.